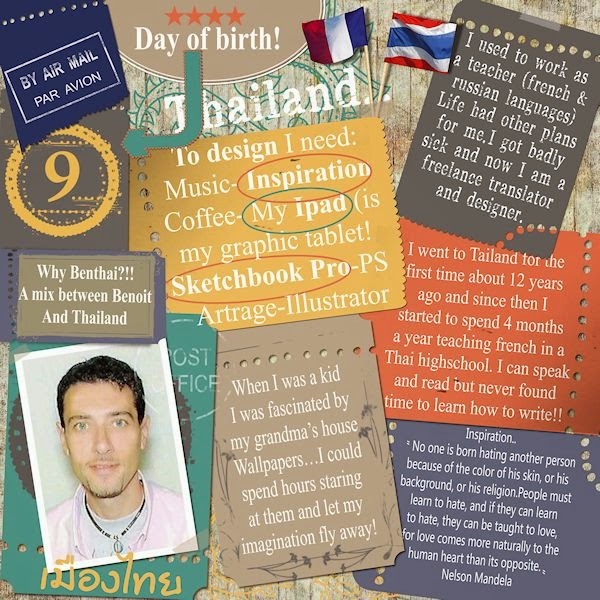 MyMemories Blog: Meet Today's Daily Designer....Benthaicreations! My name is Benoit (nickname Ben) aka Benthaicreations. I live in Bordeaux in the south-west part of France!! Why Benthaicreations..?? It is because I have been volunteering teaching french in a highschool in Nothern Thailand (Chiang Mai) for more than 12 years now..and I love the country, the culture and the language! As Thailand is a main source of inspiration for me it was obvious to associate it to my nickname..and tadaaa..ma pseudo was there!! I started designing for digiscrapbooking 5 years ago..I was a member (and then co admin) in a forum dedicated to digiscrapbooking. We wrote tutorials about digiscrapbooking, how to create everything needed for a layout from A to Z , Then I started to create more and more papers and elements... I am not a really "geek" (well..well!!) but I love everything "e"..or "d"..(electronic or digital) and the challenge to create elements or papers attracted me.. Everything about designing is very instinctive or intuitive.for me. I just love colours, light, fine textures, painting... and I think (or hope) that all that can reflect in my papers!! Here I am in a few words.. Thank you for reading...and meeting!! Visit Benthaicreations in the Design Shop and enjoy 40% OFF!